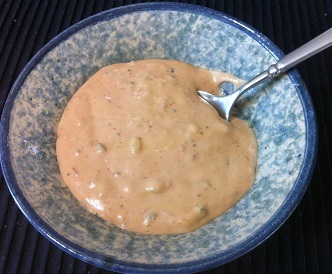 As with many recipes (if not most), a Thousand Island Dressing Recipe has many variations. 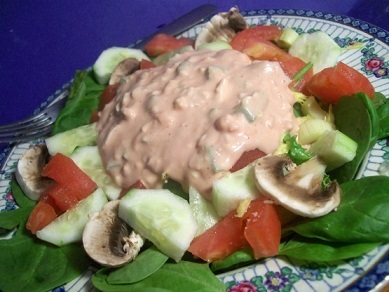 This salad dressing is a variation of Russian salad dressing (which often contains yogurt and more chili sauce or ketchup). 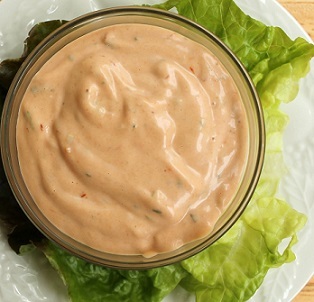 This delicious salad dressing is not only used on salads, but it is excellent as a vegetable dip. Often people use it as a sandwich spread, as well. Some people have told me the name of the dressing is because the tiny pieces of pickle (or pepper) makes it look like there are a thousand little islands in the dressing. I don't believe that is where the name came from. From what I have read, a lady by the name of Sophia LaLonde invented it about 1910. Mrs. LaLonde lived in the Thousand Islands region of upstate New York. So I believe the salad dressing is named after that region. There are two recipes for Thousand Island on this page. The first is as close to the original version as I know (Mrs. LaLonde's recipe). The second is one that has been used at the restaurant for many years and is a little more like most recipes for this dressing today. But neither recipe is "bright" orange, as you often see in grocery stores today.